anyone else get a .5-1 second lag when alt-tabbing to other instance with this? I haven't gotten a lag alt-tabbing, but if I leave my characters idle for more than a few hours I'll get a 2-10 second delay before they turn responsive upon returning. After that, they seem fine until I leave them idle again. It almost seems like key frames are backlogging when the character is out of focus and the graphics card has to catch up before continuing. The contents of the graphics memory has been paged out and needs to be put back before anything can be done. Your HDD light is probably on during that pause. 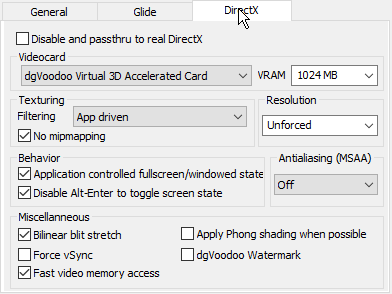 I looked in NVIDIA control panel and it looks like my card is 2GB VRAM, I've tried tinkering with the VRAM in dgvoodoo and it doesn't seem different ever. When in Mhaura or Adoulin zones I do fine with 50-60 fps, smooth even with more than 2 characters up. Then once I go into Ambuscade or Omen, I'm at almost a constant 7-15 fps even if it's only 2 characters up. I uninstalled shaders but I like having dgVoodoo as it prevented NVIDIA blip-crashes and other random crashes I used to get. Now that I've taken it off, i get smooth 30+ fps in ambuscade and omen but random crashes are back. I turned of antialiasing, mipmapping, but I'm not sure what else I need to change to make this work. 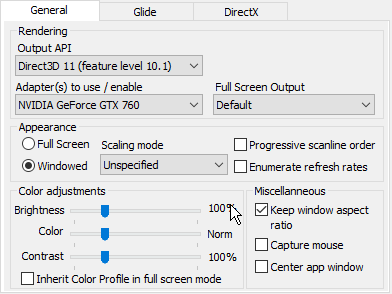 EDIT: Forgot to add my question: What should i be changing in these settings to hopefully not experience the FPS drop in omen/ambuscade? Running into an issue on my system. Playonline displays no fonts. Game is fine, only in Playonline. Yes, I have the most updated version, 2.54 WIP. GTX 1080. Any ideas? Keep "Disable pass through" checked until after PlayOnline is open. Once it's open, you can uncheck it and hit apply. The same thing has happened on my system since prior to this latest version, but waiting until after POL is started solves the issue and the app still works in actual FFXI. Remove ddraw.dll from your POL directory. The POL launcher use's direct draw and dgVoodoo has problems with how it's calling stuff. Final Fantasy XI itself only use's D3D. Ok that's far to much ***checked and messed with. Go back to defaults on everything, set VRAM to 512 or 1024 then have the rest on default / app-driven. Fast Memory Access isn't tested with FFXI and I already know it produces weird screenshots from within Windower so I wouldn't use it. Inside FFXI turn Shadows to normal or off, what resolution are you running at with Windower / supersampling / ect.? Thank you, I actually hadn't realized how much I've butchered the options compared to defaults. I've tried going back to defaults and will use 512MB VRAM see if there's noticable improvements in omen/amb. I try to turn down most of the graphics in this game like shadows/clipping plane/footsteps and whatnot so I don't think anything like that was an issue. I'm using Windower4 non-dev edition and supersampling is off. Resolution is 800x600, usually 2-4 characters active at once. I've been able to use a bunch of the added shaders w/ 1920x1080 resolution and it's fine in town but then any battle would have the low fps issue. Is anyone having occasional freezes/crashes with this? I've tried different settings, including the default settings. no freezes or crashes at all on the 4 machines i've tried it on, unless I get ridiculous with the settings. Even the old constant crashes from alt-tab or screen flickering seem to be gone. Ok in order for you to trouble shoot your root cause you need to seriously scale down the amount of ***your doing. The #1 performance enhancement from this is that it would be using your dGPU for particle and lighting effects, so having four instances with bubbles and simultaneous flashy effects will cause issues. Load up four instances of Battlefield 2 and see how that works out. If your running multiple instances you need to scale your memory limit to 128~256 MB and then inside those instances disable battle effects via in-game filters. No issues at all, its far more stable now then before. How many instances are you using and what resolution / settings are you using on them? So far virtually all problems fall into two categories, first being failure to follow directions, second being trying to mimic an octopus and multi-box an entire party on a cheap system. -I followed directions, we sorted that out a few pages back remember? Like I said I tried default/multiple settings with no difference. The crashes are mainly in Omen/Escha Zones. FFXI would just randomly freeze and I'd have to restart it. I don't even have anything checked in the Misc Section of dgvoodoo. I believe I still had problems with Texturing/MSAA set to App Driven. Makes me wonder if it's just a plugin that is doing it. This fixed it for me, thanks. That said, I have decided to remove the whole package for the time being. The cons I have ran into, for me, have outweighed the pros. -Like others have mentioned, I get a bad lag when some animations, like bard spells go off. This happens even if the animation isn't in frame. If I am close enough to hear the song, I get the lag. Really bad if im actually playing bard. -I also get more lag in areas like Whitegate now than I did without the fixes in place. This is regardless of me maxing everything or setting everything to the bare minimum. -I get lag when I switch to a new area of the map. Its as if as soon as the new map has to load (not zoning) I get a lag. -Since I have had to disable the hardware mouse for windower I can no longer zoom in and out on my mini map add-on. -When I do a shutdown from the game, Playonline viewer consistently crashes. -While I did notice some improvement in graphics if I maxed settings out, it wasn't night and day compared to what I had before and I didn't expect it to be. -Despite playing around with text settings in FFXI config, my in game text is also not as sharp. I have a 7th gen i5 CPU and GTX1080 in my desktop driving a single monitor, no dual boxing or anything like that. I would only get slight lag before i really populated areas like Mhaura, but with this package I get it in a lot of new places. Looks promising though and I will continue to watch. Appreciate all the hard work put into it. Might be, I'm running everything fine on some pretty high settings without any slow down or lag spikes. "App Driven" just means dgVoodoo won't mess with the setting, neither FFXI nor Windower do anything with those settings so they should effectively be off. 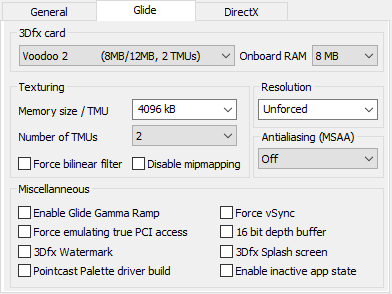 Your GPU control panel might have an "enhance the applications setting" and that could very well be screwing you over. GPU's pretty much ignore DX8->DX9 programs for their enhancements but DX11 programs get them. For whatever reason after installing this my Screenshots don't actually save. Turn off fast video memory access. Having an issue where my driver's kernel crashes which causes POL to crash. I was reading up on this with high hopes but whenever I try to download it my Antivirus(bitdefender) and browser(chrome) attempt/succeed in blocking the download. Also the only time I got the download to succeed, the .dll files vanished (were deleted?) in the background after about 5-10 seconds. Any suggestions on that end? But after reinstall vodoo tricks, if i load FF from pol classical, np vodoo works etc, but if i try to launch from windower, game crash when screen pop, any idea ? Disable both security tools for this. 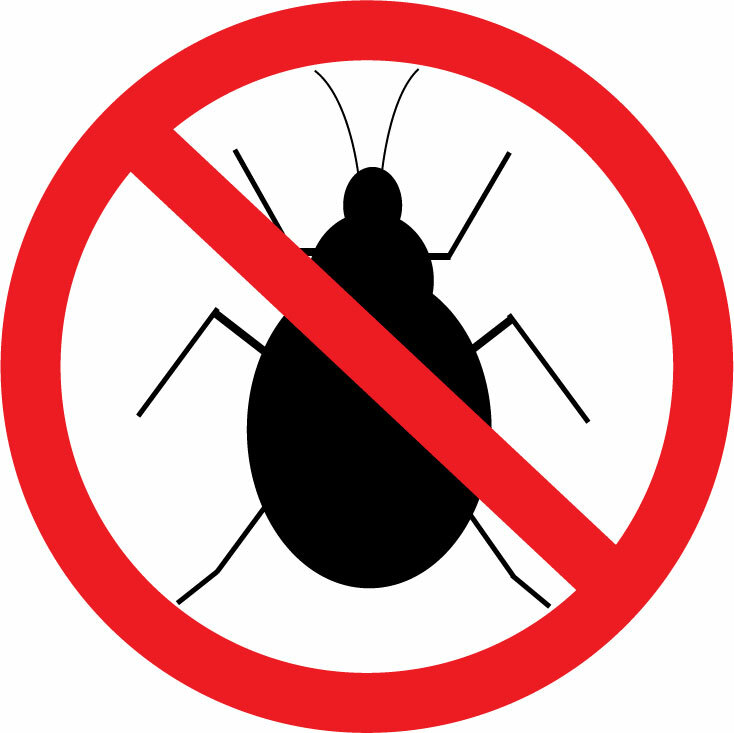 As discussed previously in this thread, how dgVoodoo2 works is exactly how a virus or other malware worm would work. Security software won't know who or what dgVodoo2 is and will treat you like a dumb person and delete stuff off your computer without your permission. Woah wait. Loading Playonline directly works differently from loading via Windower. Earlier I discussed how each use's a different "working folder" for FFXI and that folder is where the dgVoodoo2 has to be at. Windower requires dgVoodoo2 to be in the Playonline folder. Vanilla FFXI requires dgVoodoo2 to be in the Final Fantasy XI folder. Only have the D3D8.dll in those folders not the DDRAW.DLL. Also make sure your using 2.54WIP35 and not 2.54 or 2.53. 2.53 will crash Playonline btw. Nop, something didn't works, maybe after a clean win 10 install, something is missing. One friend have the same issue with win 10. Check to make sure the D3D_Compiler files are in the SYSWoW64 folder. Also make sure to "unblock" the .dll's and exe's and to run everything as admin. Or just check your dgVoodoo2 archive to make sure it's WIP35. A week or two ago I got a friends brand new Windows 10 notebook with a GTX1060 working with dgVoodoo2. I am running it on W10 Creators since a good 3+ weeks, and really like it. No apprent crashs, just slowdowns when alt+tabbing to a dual box, but thats in 2500X and +. So, I think I'm finally ready to try this, since last patch is creating constant slowdowns on my system for whatever reason, and I've been told DGvoodoo solves that. I see no updated post in the first page, or is there an updated "guide" somewhere in the previous pages that I missed? Which tool(s) do I need to download to achieve this? Where can I find a suggested configuration of what I imagine will be a plethora of different settings? (saw some screenshots from Saevel, but will that be enough? Should I configure something specific in FFXIconfig or Windower "Config" plugin? Ok, in fact its when i choose my GTX 980M, even after driver update from nvidia, sill crash, but if i pick the intel graphic, np. Anyway as sech, i have some instand freeze, but i think its only in omen.